Austin is at a crossroads. What paths will we choose as we transition from citywide to 10-1 representation on the Austin City Council? How will we address affordability in distinct parts of the city? 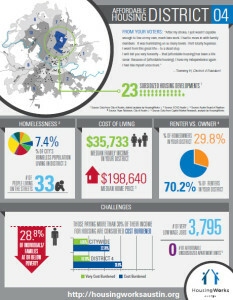 This year, HousingWorks Austin has researched and analyzed affordability, district by district. Download our reports and let us know how you plan to take action to make Austin a diverse and affordable city for all.